John Stroud spent some of his formative years in Hatfield at a time when aviation was taking off – at Hatfield and around the world. At an early age he joined Imperial Airways and spent the rest of his life in and around the aviation industry. Even after he moved away he was a regular visitor to the town. John Hector Stroud was born on 3 April 1919 at the family home at 1 Netherfield Road, Balham, London. Unlike many of the people associated with the early days of British aviation he did not come from a wealthy family. His father, Albert Hector Daniel Stroud (born 1885), was a shop assistant, who had married Laura Winifred Archer at Lambeth the previous year. Among his earliest memories was a visit to Croydon airport sometime between 1922-24. Presumably the family had moved at least once, because he wrote in 2004 that they were living in Streatham Common at the time. Even though he had been very young at the time he recalled seeing de Havilland DH.34 aircraft at the airport. However, it was not the visit to the airport and the sight of aircraft overhead that awakened what was to become a lifelong interest in aviation – rather it was articles in Meccano Magazine and paper kits of aircraft that he encountered around 1928-29. The family appear to have moved again, because he wrote in 1976 that they were living in 'near Tooting Bec Common' before they decided to move out of London. Their choice of a new home town was ultimately to have a huge impact on the life and fortunes of the young John Stroud. In the summer of 1929, the family moved to Hatfield. The reason for picking Hatfield is not clear – at the time there was no airfield. 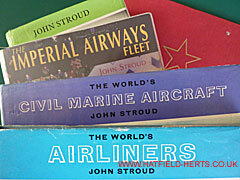 Whatever the reason John Stroud was in the right place at the right time and he saw aviation take root at Hatfield. The family's stay in Hatfield appears to have been only for a few years (he left the area around 1935) but they were enough. In any case, John Stroud made numerous return visits over the next 30 years. Unfortunately, electoral records for the 1930s, held by the Hertfordshire Archive and Library Service (HALS) at Hertford are patchy. However, both parents are shown as living at 18 Church Row in the 1930 electoral roll, and at 73 Stockbreach Road in the 1932 roll. Somewhat surprisingly, given that aviation was very much front page news at that time, only John and one other boy in his class at school were interested in aircraft. A full account of John Stroud's memories of aviation at Hatfield, in his own words, is also published on this site. It comes from Air Pictorial (courtesy of Key Publishing, publishers of Aviation News and FlyPast), a monthly aviation title in which he had a column called Air Affairs. John Stroud joined Imperial Airways in 1933 but only made his first flight with them – in their DH.86 'Demeter' – three years later. It's not clear what his role was but given that he would have been only fourteen in 1933, he probably started as an apprentice. John Hector Stroud used a number of variations of his name to sign his aviation paintings, illustrations and caricatures: 'John Stroud', 'J H Stroud', 'JHS' and 'John H Stroud'. However, in print his name is usually simply given as John Stroud. This could lead to some confusion as there is another John Stroud in print – also with Hertfordshire connections but who specialised in child welfare. This other John Stroud is John Anthony Stroud (1923-1989). After a wartime stint with the RAF, he became a social worker and author. It was in order to take up a role as a social worker that he moved to Hertfordshire in 1952. He went on to help found the Association of Child Care Officers and launched their journal, Accord. He also carried out research to help reunite twins who had been separated at birth for adoption. His work provided the inspiration for his fourteen books (a mix of novels and non-fiction). His best known works being the novels The Shorn Lamb (his first – published in 1960), and The Waif (1972). He retired as assistant director of social services from Hertfordshire County Council in 1986. He died from natural causes in 1989. John Stroud clearly had artistic capabilities, and in his Hatfield Memories article he mentioned he was involved in designing the Imperial Airways cobalt blue livery for their DH.91 Albatross fleet before the war. During his time with Imperial Airways he visited the Short Brothers' factory at Rochester on several occasions and was privileged to see most of the iconic Short C Class Empire flying boats (a design that gained lasting fame during the war as the Sunderland) during their build. Imperial Airways was one of the five organisations (the others being the four main UK railway companies at that time) that owned Railway Air Services, one of the early internal airlines, which was later incorporated into British European Airways (BEA) shortly after WWII. John Stroud knew many of the people and pilots involved (and made his first flight with RAS on 31 August 1935). When he published a book on the airline, in 1987, he included a chapter on his personal memories of flying with them before, during and after WWII (which includes mention of flights in DH.84 Dragons, four-engine DH.86's, and DH.89 Dragon Rapides). He appears to have been involved with recruitment and information / propaganda (and possibly even intelligence) work during the war (Imperial Airways was replaced by British Overseas Airways Corporation in 1940). John Stroud is credited for holding a series of exhibitions around Britain to educate people on aircraft recognition. The first was held in London, the second exhibition was at Princes Street, Edinburgh on 19 March 1940. This is known to have included scale models, photographs, colour drawings and silhouettes of British and German aircraft. Also models or dioramas of the Kiel Raid, the raid on the Firth of Forth and a balloon barrage. 17 June 1940 was the date of the Glasgow exhibition – at Rowans Ltd, Buchanan Street. Later in April that year, his illustrations of unit markings found on German aircraft were published in Flight magazine. He also did work for the Air Training Corps Gazette (it's not clear whether as an employee or just a contributor). In late 1941, a folder he had prepared detailing 52 aircraft types used by the Russian Air Force was published by Rolls House Publishing Co Ltd for the ATC Gazette. John Stroud illustrated a 1942 article on the Chinese Air Force in the Air Training Corps Gazette, which had been written by Captain W E Johns – the creator of Biggles. His first aviation book on the Russian air force was published by The Pilot Press in 1943 (possibly this was an expanded version of the Rolls House folder). In 1946 he published the first book on Japanese military aircraft in the West through Harborough Publishing Company Ltd of Leicester. By now he had established himself as an authority on aviation, and post-war he concentrated on civil aviation. He had married before the end of 1952, and he and his wife Patricia travelled widely. He was a regular contributor (including an article on Moscow Airport in 1952) and correspondent in the aviation press. His wife clearly shared his interest in aviation and had articles on the subject published independently and jointly. In 1954 he became the aviation expert for The Journal of Commerce, and had a regular column. The Times published his article commemorating the 40th anniversary of British Air Transport in 1959 (and also published articles under his name in 1962 and 1963). In 1961 he took over from Owen Thetford as general editor for Putnam's Aviation List (later Putnam Aviation Books and Putnam Aeronautical Books). Many of these books, which were written by expert authors, are now standard reference works on individual manufacturers (like A J Jackson's De Havilland Aircraft since 1909), British aviation development and airports (JS literally wrote the book on the last subject). In 1985 he wrote his last column as the aviation expert for The Journal of Commerce, ending a 31-year unbroken stint (which may be a record in itself). His last published work before his death is thought to be The Imperial Airways Fleet, published in 2004-5 (Passenger Aircraft and Their Interiors 1910-2006 was published shortly after his death in 2007). Flying as a passenger during civil aviation's infancy was not without risks, and he had his share of excitement (he is reported to have worn gloves during takeoffs and landings in case he needed to clear jagged wreckage out of his way). John Stroud died in hospital on 14 March 2007, aged 87. There is an unconfirmed report that his collection of aviation memorabilia was sold at auction later that year. Sadly, most of John Stroud's books are now out of print. However, copies can still be found in libraries and from second-hand booksellers. Please note: the underlinked links below will take you to to the Amazon.com site.